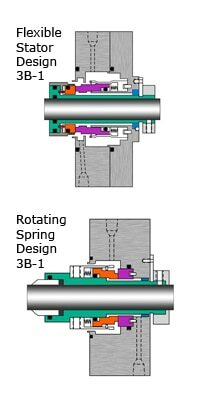 The FSI 3000 Series mechanical seal is a multiple spring design available in both balanced and unbalanced configurations. The basic 3B/3B-1 can be offered for single, dual, or tandem operation. Most 3000 Series mechanical seals are custom engineered designs due to operating conditions and / or equipment type. Close clearance restriction bushings, floating throat bushings, and lip seals for use in conjunction with API Plans 21, 23, and 32. A complete line of standard and custom designed seal reservoirs to support tandem and double seal operations per API Plans 52 and 53. Specifically sized and selected heat ex-changers for proper seal cooling when using API Plans 21 and 23. Custom engineered bearing isolating devices for specialty equipment applications. Sizes: Up to 6.00”. Available in both inch and metric sizes.